Chocolate or porridge for breakfast? Which would you choose? For Belle the answer is easy - chocolate, of course. Belle rejects the bowl of plain porridge for breakfast and sails for Giant land.where the Giant in residence has so much chocolate he is bored of it. With the Giant, Belle explores his land of chocolate where she builds a tower of chocolate blocks, swims in chocolate milk and admires the chocolate sculptures in the garden. All the while, she is having her fill of chocolate until eventually Belle sails home with Giant who adores the porridge Belle makes for him. Before Giant returns home he leaves an enormous bowl of chocolate for Belle. As she plays over the next few weeks, she eats and eats and eats chocolate until she can eat no more. A message in a bottle arrives from Giant with his thanks and a hint that she should try porridge with honey and cinnamon. This is a winning combination for Belle and the giant chocolate bowl becomes a giant drum. Marion Lucy's text is carefully constructed and she uses some beautiful phrases. I particularly loved 'The freckled porridge glittered and shone'. Belle is an engaging and playful character whose love of chocolate, although immense, never comes across as gluttony despite the mammoth amounts she eats! The friendship with Giant is nicely portrayed and the book avoids overt didactism. 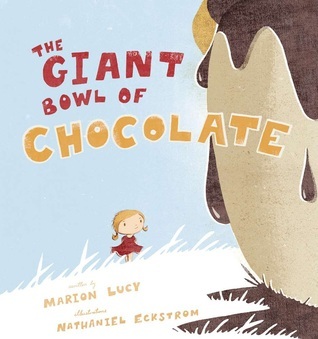 Nathaniel Eckstrom's illustrations are quirky and full of life and children will no doubt pore over them. The retro shades of blue, red and brown chosen give the book the comfortable feel of a 1950s picture book. The spreads are nicely laid out with the text interweaving with the illustrations to exacerbate the playful feel of the story. Chocolate is a sure fire winner with most kids and this book is one they will enjoy.